Our Products: Fingerling Potatoes > French Fingerling - Available! Though plumper than most, this potato (also known as "Nosebag") is still considered a fingerling. 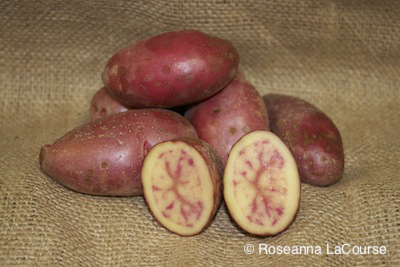 Radiant rose-red skin and deep yellow flesh with an occasional red ring make this potato stand out. Creamy, smooth texture with exceptional flavor lends itself well to salad with thinly-sliced red onions and chunks of crisp cucumbers. Abundant, long, plump tubers seem to tumble out of the earth. Tall plants with red veining fill the row. «Heirloom» Conventional Seed.